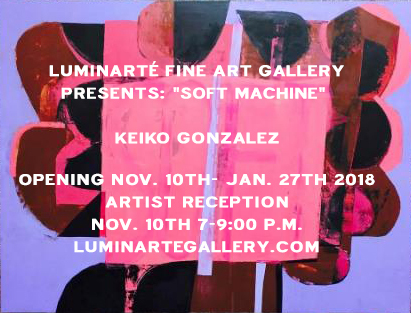 Keiko Gonzalez’s newest series, Soft Machine, references the William Burroughs novel – an abstract piece of writing, a collage of thoughts – that resemble Gonzalez’s own collage of images that are continuously and vibrantly renewed, always through the lens of painting. His intense 30 year practice is a form of lyrical expressionism steeped in literature, pop culture, modern painting and contemporary world politics. The title also invokes the human figure, a reoccurring reference and key part of the painter’s larger abstract puzzle. This circles back to the artist himself, a soft machine, a maker of a thousand paintings.